Do I have a favorite pie? Why, yes. Yes I do. I really love pie. It’s such a versatile dessert, I always have the ingredients to make some variety of its pastry goodness, and I honestly can’t think of a kind I don’t like. Unless of course it’s a pie that comes from the dark side. I don’t like dark side pies. 1) The “I can’t stop thinking about you because you’re a state fair blue-ribbon prize winner/hall of fame rock star” pie. 2) The “dark side” pie. Also known as the “soggy-bottomed, overly-gelled filled, pretty-to-look-at-but-awful-to-taste, stink-fest” pie. I don’t like these pies. Oh man, do I love Strawberry Rhubarb Pie, in spite of — or perhaps because of — its old-timey charm; at their best, cooked strawberries taste like cotton candy and rhubarb is the perfect almost citrusy-sour contrast. Strawberry Rhubarb is my favorite pie. A few weeks ago, my awesome pie-making boss told me he had access to obscene amounts of rhubarb. (yes!!!) The Lord provides. Yesterday, he called to ask me how many cups I wanted. Through my pure glee and excitement over a sour plant, I said, “five, yeah, five cups — enough for two pies. Thanks Naidl.” Awesome. Five cups of rhubarb coming my way. Then, he sweetened the deal by offering to cut it up for me. Double Awesome. So today, I received eight cups (three more than requested!!) of pre-cut rhubarb from Ryan Naidl. Boom!! Thanks Naidl. Best boss ever. Action had to be taken people. In between discipleship, Bible study, training and some MPD, I made pie. Don’t say you don’t have time to make pie. There’s always time for pie. 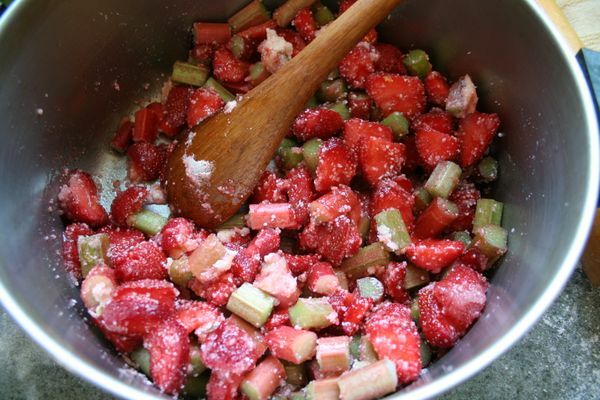 Stir together rhubarb, strawberries, sugars, vanilla, cinnamon, salt and tapioca in a large bowl. Mound filling inside bottom pie crust and dot with bits of unsalted butter. Roll second half of pie dough into an 11-inch circle and cut decorative slits in it. Transfer it to center over the pie filling. Trim top and bottom pie dough so that their overhang beyond the pie plate lip is only 1/2-inch. Tuck rim of dough underneath itself and crimp it decoratively. Do ahead: Pie should keep for up to three days at room temperature but I have never, ever seen one last that long. 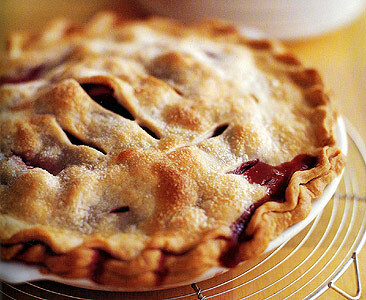 Mmmm strawberry rhubarb pie – can’t go wrong!